Burger King 2 for $5 Menu! 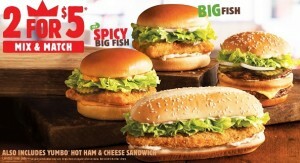 Burger King has announced that the Spicy Big Fish Sandwich is joining the lineup on their 2 for $5 menu. The Spicy Big Fish Sandwich is 100% White Alaskan Pollock, breaded with crispy panko breading and topped with creamy spicy sauce and tangy pickles, all on top of a toasted brioche-style bun. Burger King’s 2 for $5 menu features the Yumbo Hot Ham & Cheese Sandwich, Big King Sandwich, Original Chicken Sandwich, Big Fish Sandwich and Spicy Big Fish Sandwich. Limited time only. Price and participation may vary. Single item at regular price on menu. Not valid with other offers.